My Amazon order history says a lot about my purchasing habits. I am a buyer of needs vs. wants. Pet food. Printer ink. Humidifier filters. But every now and then, a little something nostalgic sneaks into My Shopping Cart. Favorite childhood books for my one-year-old granddaughter. A balloon-launching catapult to make a Thanksgiving turkey fly (it didn’t). Italian chocolates from Perugia, also discovered during a year abroad in college. And just today – on total impulse – a Rubik’s Cube. 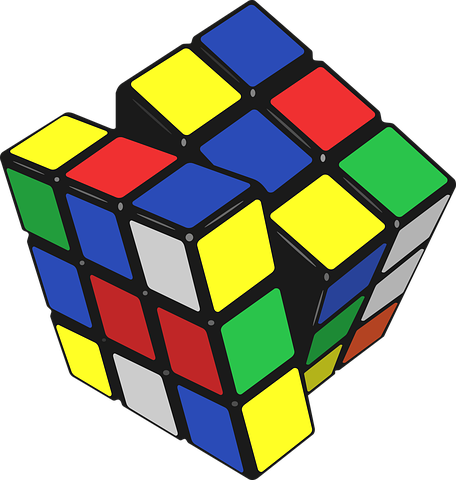 Rubik’s Cube – adding a few wrinkles to us baby boomers – celebrates its forty-fifth birthday this year. Back in 1974 when it was invented (and originally dubbed “Magic Cube”), the 3x3x3 trinket earned our attention for its mechanical magic as well as its almost-impossible-to-memorize solution. To be precise, there are 43,252,003,274,489,856,000 (that’s “quintillion”) possible positions of Rubik’s colorful squares. The Cube comes with neither instructions nor answers. Already solved in its packaging, you can’t help twisting it up into a mess of color. In our pre-Internet world, Rubik’s Cube required endless gyrations in search of the answer (instead of just, “Hey Alexa”). But there was something immensely satisfying about the resulting nine squares of single color on each of its six sides. There was also something tempting about peeling off the colored stickers and rearranging them instead. 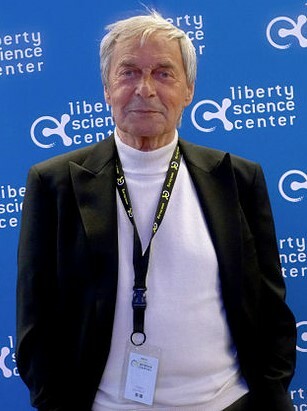 Erno Rubik, a Hungarian inventor, was an architect and architecture professor “searching to find a good task for his students” when he completed the Cube’s first working prototype – a mess of wood blocks and rubber bands. A small plastics company took a chance on its manufacture and the rest is history. In the first four years alone, two hundred million Cubes were produced and sold. I was in college (and also an architecture student) when Rubik’s Cube first hit the shelves. Its perfect symmetry and twisting ability to reinvent its colorful look went hand-in-hand with my interest in building design. I remember keeping a Cube on my dorm room desk – at first for mindless manipulation; later for successful solving. Not that I could solve it quickly, mind you. The world record – an average of five solves – is six seconds. The world record with one hand (???) is nine seconds. The world record using only your feet (again, ???) is twenty-two seconds. My solve is expressed in minutes, if not hours. Few puzzles compete with Rubik’s Cube for sheer “can’t put it down”. But there are a few. 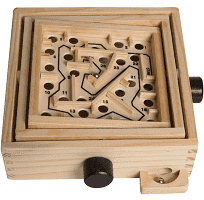 One of my favorites was the wooden double maze, the box-like puzzle with the Etch-A-Sketch dials on the side, maneuvering the steel ball through the walled maze without dropping it through one of several holes. I devoted hours and hours to that puzzle, always sweating those final tricky turns to the finish. 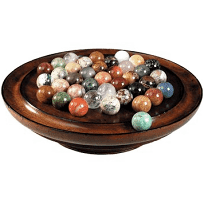 Another favorite: Marble Solitaire, where you hop-eliminated marbles in search of the perfect solution: a single marble standing proudly in the board’s center divot. 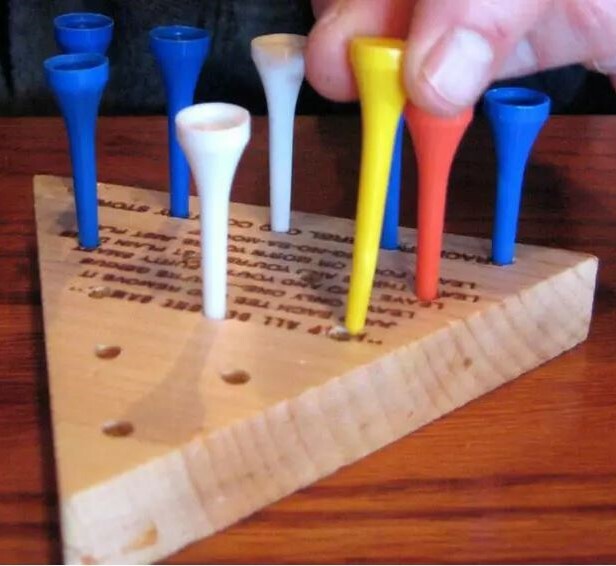 Finally (courtesy of Cracker Barrel restaurants), how about “Triangle Peg Solitaire”, the hop-elimination puzzle with the colored golf tees? Thanks to that little game, my kids were supremely patient after the dinner order was placed. With somewhere near four hundred million sold, Rubik’s Cube is considered the best-selling toy of all time. Its inventive design landed the Cube in the permanent collection of the Museum of Modern Art (MoMA) in 1982. The Cube also garnered “Toy of the Year” in eight countries, including Germany, France, and the U.S.
Inevitably, there were attempts to advance Rubik’s design, such as a 4x4x4 version (“Rubik’s Revenge”), or pyramid, dodecahedron, and hexahedron shapes. 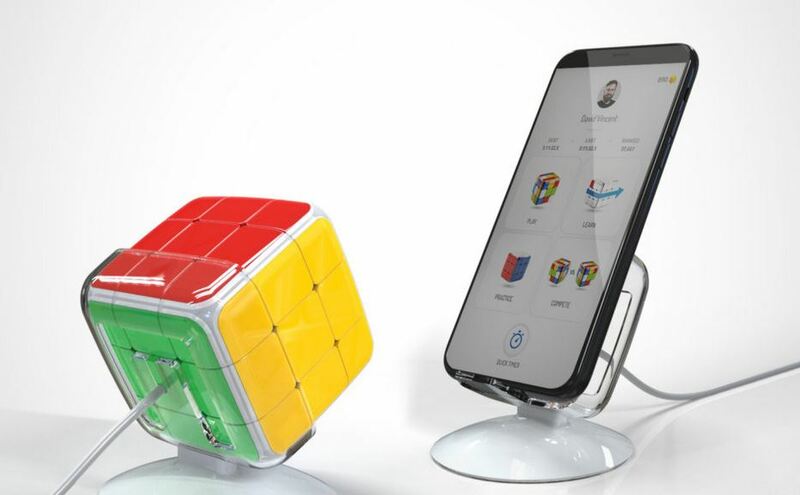 But going completely off the rails, look no further than GoCube – a thoroughly high-tech update to Rubik’s. GoCube is also 3x3x3, but rimmed with LED lights, and contains wireless smart sensors, an embedded gyro, and an accelerometer. Download the GoCube app to your phone (of course there’s an app), and watch your twists on-screen instead of on the cube itself. The app guides you to the solution (if you so choose), creates alternative mosaic-looking puzzles, and run reports on solving speed and efficiency. You can even wage virtual head-to-head competitions. All for “only” $119. 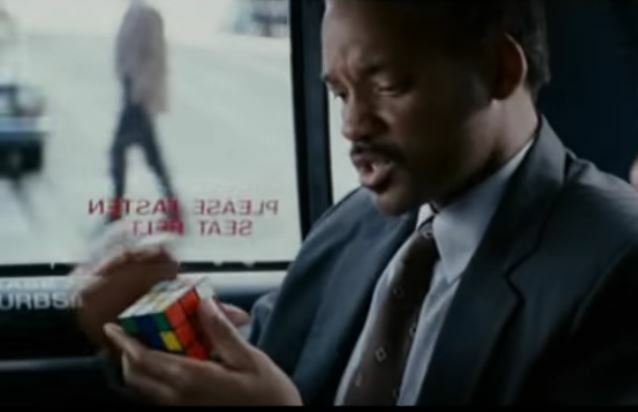 I’m sure Erno Rubik (and Will Smith) would pooh-pooh GoCube as too much of a good thing. I would agree. The app-driven, light-up, hundred-dollar GoCube is over the top, with zero nostalgia to boot. On the other hand, Rubik’s Cube cost me $4.59 on Amazon. That’s a sweet deal, and a cheap way to learn how to do the twist all over again. This entry was posted in America, culture, memories, technology and tagged architecture, Cracker Barrel, GoCube, marble solitaire, maze, puzzle, rubik's cube, toys, trinket. Bookmark the permalink. 2 Responses to Let’s Do the Twist! Hey Dave, you’ll be happy to know one of the more popular clubs at my school is The Cube Club! It’s all about Rubik’s Cube. Thank goodness there are still kids out there who don’t spend all their time playing video games! A whole club for the Cube? Wow. No matter my surprise – I completely agree. Anything reducing screen time is a positive. Thanks for letting me know!